“Stay at Everton as long as you can because there is only one way after leaving this Club, and that is down.” – Duncan Ferguson. If all the energy drink, alcohol and confectionery moguls met up with a few drug dealers and formulated the ultimate artificial high, it still wouldn’t come close to the buzz we all felt on that famous Wednesday night. 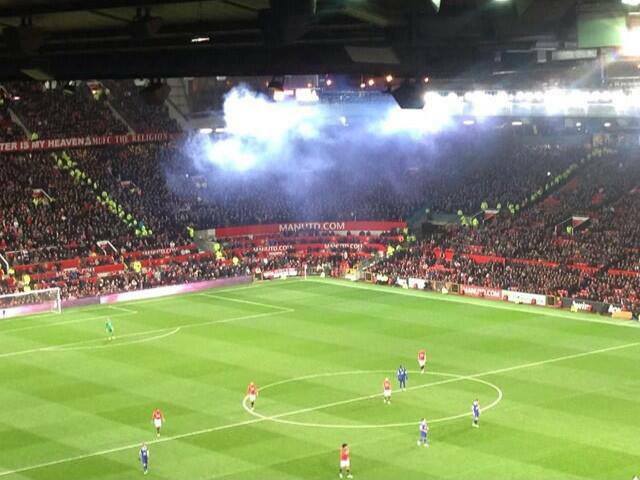 Anyone fortunate enough to have been packing out that away end will remember it for the rest of their lives. And, just for a bit more icing on the cake, United lost again at home to Newcastle. Boss. 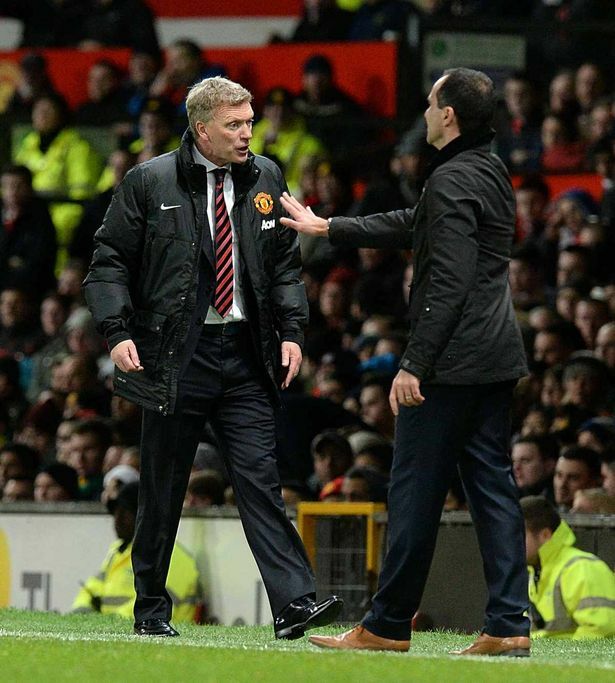 Frankly, we’ve had our fun now, putting Moyes in his place after a few unwise words. Let bygones be bygones. Cheers for helping us compete again Dave, but we’ve got a boss who can do more now. Roberto Martinez proved beyond question not only his ability to encourage free-flowing football but to get the tactics right on the big stage. We deserved victory, and that sets us up nicely for the next game. Which happens to be the runaway league leaders away. Normally, playing at the pacesetters is tough enough. That’s normally a defeat at Old Trafford, but we’re heading to Arsenal. Which is normally a defeat too. Christ, Moyes left us in it. I’m lucky enough not to be related to any Kopites, but with half the family being Gooners, this is normally the weekend where me ma feigns empathy for us and me granddad’s on the phone straight away for a good gloat. Wouldn’t mind giving the arl’ call of my own this time around. Arsenal have cruised through the season with just the two blips against Aston Villa and Manchester United (imagine losing at Old Trafford, eh. Shocking.) They disposed of Hull (imagine not being able to beat Hull, eh) and rested a few players for it too. And that all adds to the trademark Arsenal behaviour when fans get extremely over-confident despite a procession of disappointments over the years. They just don’t learn. Nevertheless, they’re big favourites, and that’s fine. Arsenal – played 5. Won 3, drew 0, lost 2. Everton – played 6. Won 4, drew 1, lost 1. The shite – played 6. Won 2, drew 2, lost 2. And people are trying to claim that we’re not competing with this lot? Incredible. The system that worked against Manchester United will have to adapt for the challenge of Arsenal. While the midfield was United’s weakness, it will be Arsenal’s strength on Sunday, especially in the advanced positions. Barry and McCarthy will have to play in deeper roles, while Pienaar and Mirallas will be tracking the runs of Ozil, Ramsey, Cazorla or Walcott. It’s a tough ask. Luckily, our midfield has been as impressive as any we’ve seen in the royal blue since the side that finished 4th nearly a decade ago. Gareth Barry is my personal choice for Player of the Season if games from August to now are the only ones taken into account. He has been the cool, composed, tough-tackling lynchpin the whole side revolves around. While McCarthy has also been class, Barry has both the experience and the bite to keep Ozil quiet. It has been done by lesser players this season. Their full backs, Sagna (or Jenkinson) and Gibbs, are of course good players. But they haven’t been subjected to a lot of counter-attacking this season, and were punished clinically by Villa on day 1 when they were put under that pressure. As tough as it will be for Oviedo and Coleman, they need to do what they did against United on Wednesday. It was that positivity that brought us our first win at Old Trafford since 1992, and it could also help us to a first win away to Arsenal since 1996. Lukaku was boss without scoring against United as well. He made Nemanja Vidic look like one of those old sorts in Sunday League who reckon they were the next T.G Jones back in the Seventies. And that allowed Ross Barkley and then Gerard Deulofeu – who frustrated with his wastefulness – to attack the space left by the hapless centre back. 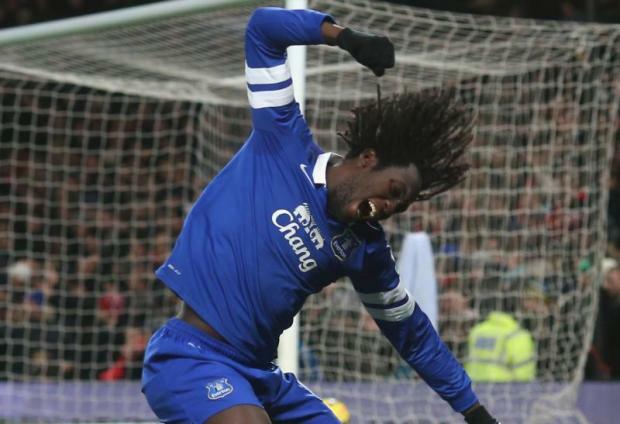 Look at Rom’s celebration too. Everton, that. It’s fair to say that we rode our luck against United with a couple of chances that came their way. But how good is Tim Howard, eh? Most clean sheets of any keeper in the Premier League thus far. Magical. And the clumsy keeper who used to fall on his arse when under pressure in the penalty area is now positive in his actions and sharp in his reflexes. The Martinez regime as a whole is having a clear impact. 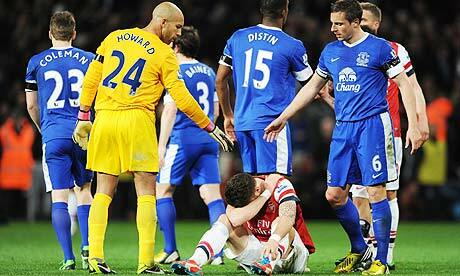 So Arsenal will be expecting that plucky old Everton who have came and gifted them points over the years. What they haven’t quite cottoned onto is the fact that this is a whole new team, with fresh ideas and a few results to boot. This will undoubtedly be seriously tough, and we’d surely take a draw back home with few complaints, but there are three shiny points floating about the horizon. Imagine winning at Old Trafford and the Emirates in the space of a few days. It actually seems possible, doesn’t it? Roberto Martinez, ladies and gentlemen. Making Arsenal out to be daft. They’ll have done their homework and they’re top for reason. Definitely going to be harder to get anything out of this than you’ve made out. There’s nothing wrong with the glass being half full rather than half empty… For a change.